Two types of meat — chunks of beef plus chorizo sausage — give this chili a hearty helping of flavor. We stirred in chipotles for a touch of smokiness, then let the chili simmer. This chili is in the range of two to three-alarm spiciness. You can find tubes of Mexican chorizo in your grocer's meat freezer. Season stew meat with salt and pepper; brown meat in oil in a skillet over medium-high heat for 5 minutes (optional). Combine stew meat, tomatoes, beans, chorizo, onion, corn, garlic, chili powder, chipotle in adobo sauce, cumin, and oregano in a 4- to 5-qt. slow cooker. Use a wooden spoon to break chorizo into chunks. 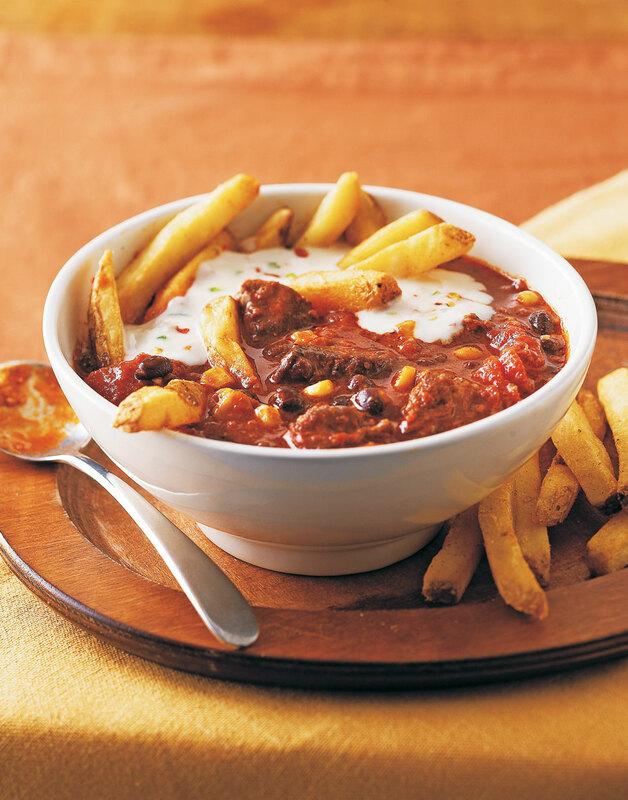 Cover chili; cook until beef is tender, on high-heat setting for 3–4 hours or on low-heat setting for 7–8 hours. Chipotle chile peppers and fire roasted tomatoes both are sold in cans. Look for chorizo in a tube. Thaw frozen corn before adding to the slow cooker so the cooking temperature rises quickly. Try any of your favorite french fries — thick, thin, curly, waffle, or crinkle-cut — with this delicious sauce.